The Boston Symphony Orchestra subscription concerts running February 9 – 11 bring the popular local women’s vocal ensemble Lorelei to the Symphony Hall stage alongside noted countertenor Bejun Mehta for the Boston premiere of George Benjamin’s orchestral song cycle Dream of the Song, a BSO co-commission for the Tanglewood Music Center’s 75th Anniversary Season in 2015. Ravel’s Le Tombeau de Couperin and Berlioz’s Symphonie fantastique will complete the program. Benjamin (b. 1960) began his long association with the BSO and Tanglewood in 2000 as director of the Festival of Contemporary Music, and he returned several times as a member of the composition faculty. Along with the 2016 American premiere of Dream of the Song, Tanglewood performances of his major works include the U.S. premiere (unstaged) of his opera Written on Skin in 2013 and his Duet for piano and orchestra in 2012, among many other works. The BSO has also performed his music on numerous occasions. In the 15-minute work, the highly regarded American countertenor Bejun Mehta will sing about mortality and the passage of time from Peter Cole’s English translations of 11thcentury Hebrew poems from Andalusia in his Dream of the Poem: Hebrew Poetry in Muslim and Christian Spain, 950-1492. 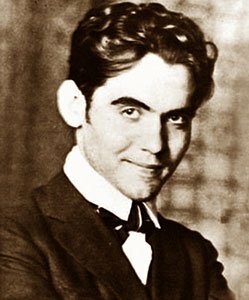 Eight women of Lorelei intone responses in Spanish from fragments of poems of Federico García Lorca (1898-1936) which were in turn inspired by and based on 8th– and 9th-century Arabic verse, also from Andalusia. According to BSO annotator, Robert Kirzinger, “The frisson between countertenor and chorus; between the two sung languages, Spanish and English; and colored by our abstract awareness of the friction between the Moorish and Jewish cultures, is counterweighted by the sense that the Hebrew poems, sung in English, and the 20th-century Spanish translations of the Arabic nonetheless consider similar. The shimmering harmonies in both voices and orchestra veritably paint light itself.” Kirzinger’s compete notes are here. The full Lorelei Ensemble consists of nine women who maintain independent careers as soloists and ensemble singers. Expanding the repertoire for women’s voices is a fundamental part of their mission, and since the group’s founding in 2007 they have premiered over 50 pieces. Under Artistic Director Beth Willer, the Lorelei Ensemble has performed locally with the Boston Modern Orchestra Project, Odyssey Opera, Grand Harmonie, Boston Percussion Group, and Juventas New Music. About Lorelei Ensemble from Loreleiensemble on Vimeo.